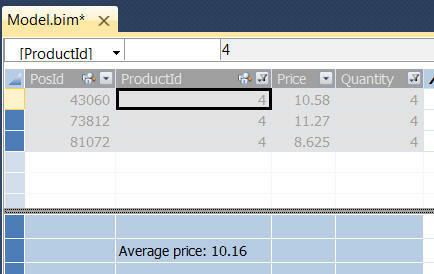 To create formulae in SSAS Tabular you need to learn DAX, the language used for creating measures. 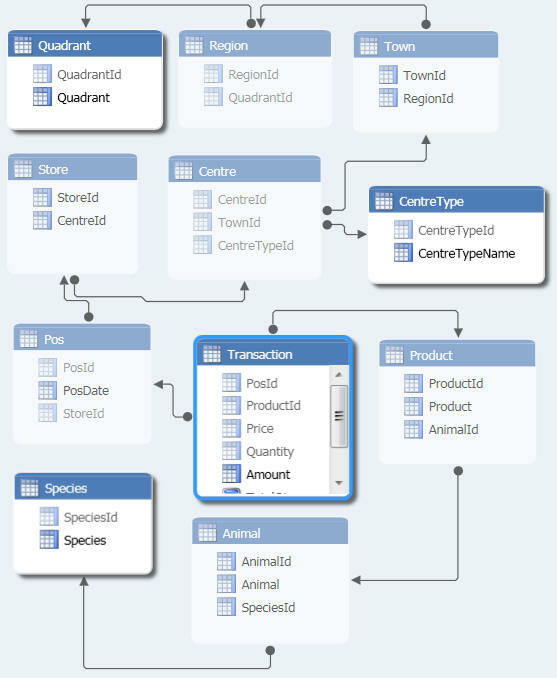 This blog shows the basic syntax of DAX, and explains how SSAS Tabular uses query context in a pivot table to aggregate data correctly. 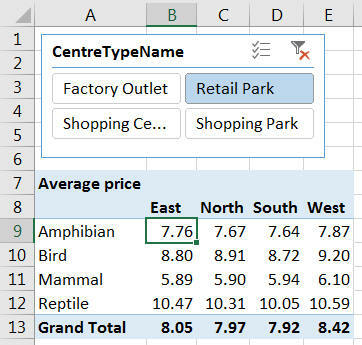 The average price of Amphibian products sold in the East region in Retail Park centres was 7.76. The transaction table is at the child end of all of the relationships. 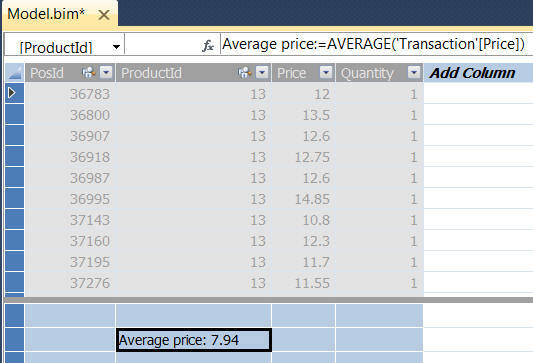 It's probably reasonably obvious that if you're going to calculate the average price across all of the transactions for any pivot table cell's query context, it makes sense to put the measure in the Transaction table. 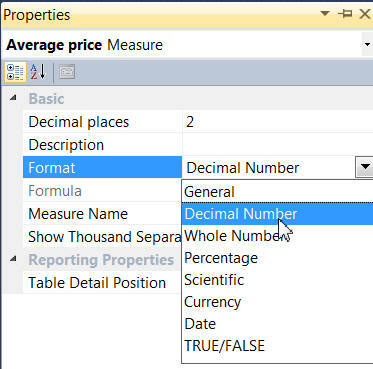 The area at the bottom of a table (underneath all of the rows) contains any measures that you type in. The surprising - to me, at any rate - answer is that ANY cell will do! 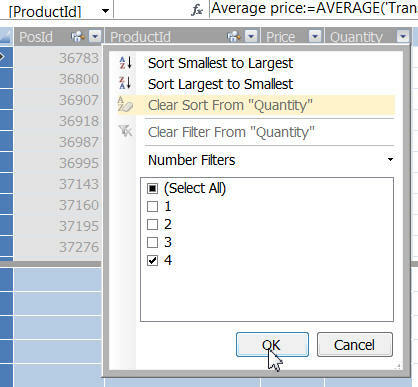 In the diagram above I've selected one more or less at random (although choosing one underneath the Price column may have made more sense, it's not necessary). 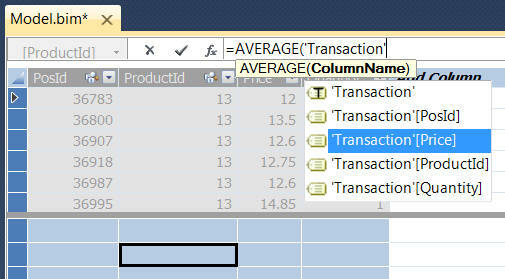 I think this is a failing in the SSAS Tabular interface. There is no reason to store the measures you create in a grid at the bottom of each table (a separate storage space on screen would have been much more sensible). Type in your formula, using the punctuation characters below.
' The apostrophe key brings up a list of tables. [ The opening square bracket key brings up a list of the columns in a table. SHIFT + ENTER This key combination inserts a new line in a formula. Space bar The space bar inserts blank spaces to make measures easier to read. Here I've used spaces and a carriage return to make the measure easier to read. You can click and drag on the line below the formula bar to make it bigger or smaller. Note that for most tables you don't need to encase the name in apostrophes. Transaction is, sadly, an exception (being a special word in SQ)L, which is why we need to write it as 'Transaction'. You can change the measure name by overtyping it. You can overtype the measure name using this property. The name of the measure has been changed. 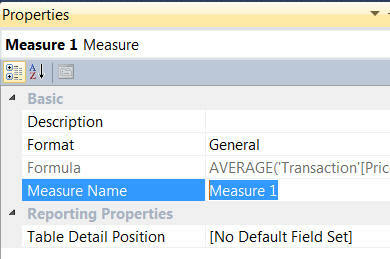 Press F4 if necessary to bring up the properties for the measure, and change the default format as shown here. 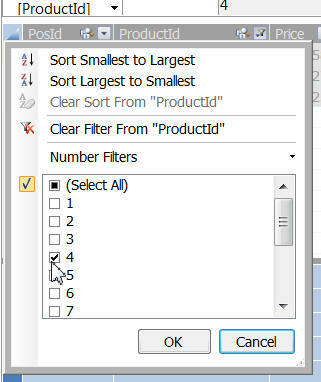 You can also specify whether you want to display a thousands separator. Initially there are 13,904 transactions, the average price of which is 7.94 pounds. 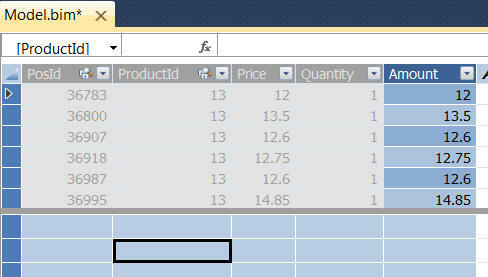 Here we've clicked on the drop arrow next to the Quantity column to show only those transactions where 4 items were bought simultaneously. We're now using the same method to show only items for product number 4. The average of 10.58, 11.27 and 8.625 is indeed 10.16. Here I've dragged the measure created into the VALUES section of the pivot table field list (I've also removed the filters set above). 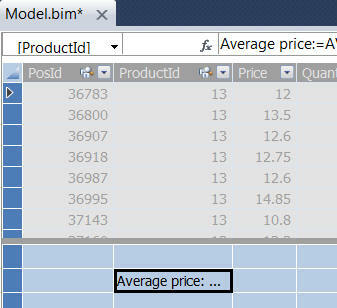 The average price is calculated for each query context. Note that the formatting is set correctly too. Now that you know how to create a measure, let's look at the basic DAX syntax rules.